In the winter when it's raining a lot, we stay indoors and plan out the rally. As the commitments come in, the momentum builds and by spring we're looking at a full schedule of guest speakers, rides, clinics, evening entertainment, seminars and good times ahead! Last year's 10th annual rally was a milestone of sorts, but for the 11th edition we're not cutting back on the good stuff. Here's a run down of what we have in store for you this year. 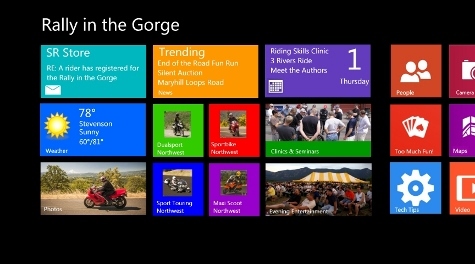 Whether you ride pavement or dirt, we can't emphasize what a wonderful place the Gorge is to ride. That alone is reason enough to make the trip and experience the roads as we interpret them through our unique routes available as printed maps and uploadable GPS files. Our routes get you off the beaten path and offer some stunning road work and scenery. Consider it a five day roller coaster laid out by pros. People are also a good reason to join in on the rally, too. You can learn a lot from our guest presenters. Here's a few of note. Lee Parks is returning to the rally and will be conducting several seminars during the event. Lee wrote the book "Total Control" and his Total Control Training is taught around the U.S. He'll also be involved in the Saturday Morning clinic at Maryhill. Advance registration for that clinic (separate registration required) is close to sold out, so if you're on the fence, you'll want to get down to business, register for the rally and register for the clinic. 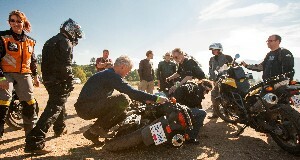 Our good friend David Hough returns with his riding skills wisdom, and will run several seminars designed to make you more aware of what is going on with your riding. Mr. Hough is the best selling author of "Proficient Motorcycling" and "Mastering the Ride" and will likely debut his new book during the rally - "The Good Rider." Riding instructor "Coach" Ramey Stroud has spent the last three years riding around the world. He's joining us again this year and will be presenting four different body positioning clinics designed to meet the needs of sport bike, sport touring, dual sport and maxi scooter riders. He also plans to run an evening slideshow sharing highlights of his world tour, comparing and contrasting riders of all styles from around the world. Tim Bernard of Happy Trails will be on hand with a trailside repair clinic and is also hosting a dual sport ride into the Klickitat Reservation (otherwise off limits) that will include a salmon bake luncheon. That ride is limited to 15 riders. Connie Adams is hard at work putting together a nice assortment of goods for our silent auction you can bid on throughout the rally. Proceeds fund our Skamania Kids Explorer Fund. Don Daugherty of All Moto Tire ran an informative tire Q&A that was very popular last year, so we've asked Don to run it again and he's agreed. The Q&A is open-ended so bring your tire questions and get ready to learn a lot! 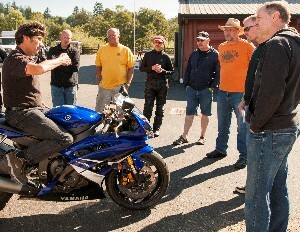 Retired AMA racer Mike Sullivan is also returning this year and will be teaching an on-road clinic specific to throttle control. Our Friday fun run is once again an all-new route! Titled 'The End of the Road,' it's loaded with twisties and secret roads you might not otherwise visit on a trip in the Gorge. There is a street version as well as a paved version -- but both share the same checkpoints! 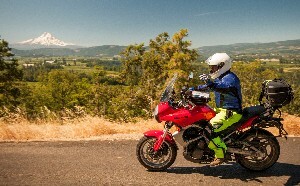 Puget Sound Safety returns to the rally offering a beginning dual sport rider class and working together with Lee Parks on the Maryhill Loops Road clinic Saturday morning. Talk about an adventure. 50 years ago Ride West owner Keith Thye rode from Oregon to the tip of South America. To commemorate that trip, he repeated the route this year and will be presenting a slideshow that documents the eventful journey. 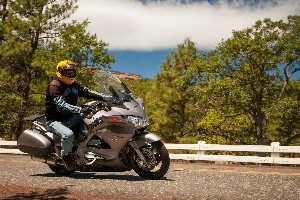 Want to learn to take better pictures when you go riding? Now's your chance to learn from a pro. Our resident photographer, Turk, will run a rolling clinic taking you to several scenic photo locations and upping your photo skills. All cameras and riders are welcome. Would you like a history lesson about local motorcycling? There's no one who knows more about motorcycling in the Northwest than the lead curator for the Pacific Northwest Museum of Motorcycling, Tom Samuelsen. Don't miss his slideshow Thursday night.